Please scroll to the next post for Growing in Unity - you still have a chance at a Unity single! I'll announce sometime tonight during hip hop! For the challenge this week on the Victoria Case challenge blog - we have a sketch - I flipped it this week. 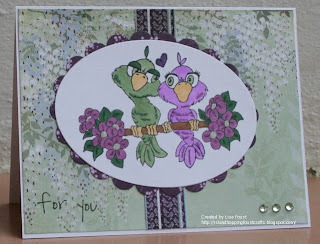 I used the Luv Birds rubber stamp for this one, colored with copics and accented the centers of the flowers with some silverfox smooch. I made this card using some inspiration from the Etsy inspired shop this week - this piece was my inspiration. I'm trying to get some friends to join in on - because Ashley is doing a bogo - if a friend enters and says that I referred them, I can be entered for some great blog candy AND the friend who enters is entered for some candy too! If you have never joined in on Ashley's challenges, please do and tell her that Lisa sent you! This is adorable! Thanks for playing again this week! I hope one of your friends joins in! You have a great chance of winning the $25 gift cert from PMS! Super cute Lisa, you know I love that VCD image! This is beyond cute! I love it! Don't forget to tell your friends to play along so you can be entered for the PMS stuff! Thanks for playing along with our challenge this week, it means so much to me! So adorable. I love the colors.